This 4 in 1 hand truck has the versatility for every kind and size of job. It easily converts to different positions. (No bolts or screws) The built in toe plate extension folds down to support extra large loads. There is a 45% incline position for support in handling while transporting the load. The 52.5" height is great for high stacking applications while in the 2 wheel vertical position. 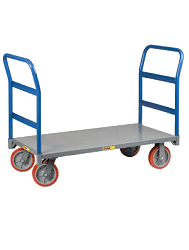 This unit can be quickly converted from a 2 wheel cart in the vertical position to the 4 wheel platform cart in the horizontal position. This allows it to be used for a wide variety of loads. The 4 in 1 truck has a load capacity of 800 lbs in the vertical position; 500 lbs in the 45% incline position; and 1000 lbs in the horizontal position. The 10" puncture proof tires never go flat. Just bought this and I am very pleased with it. Solid and versatile. Good buy, took some time to get. Everything else is good.